The bulk of contemporary economics assumes rather than explains differences between people or groups of people. Yet, many of these differences are produced by society or they imply differing opportunities and outcomes. This book argues that economists should concern themselves with the explanation of the social causes and effects of such differences. D’Ippoliti introduces the concept of diversity to summarise all differences that are of social origin and that a theory or model seeks to explain. This contrasts with the traditional concept of heterogeneity that instead refers to differences that are deemed to be exogenous of economic theory. 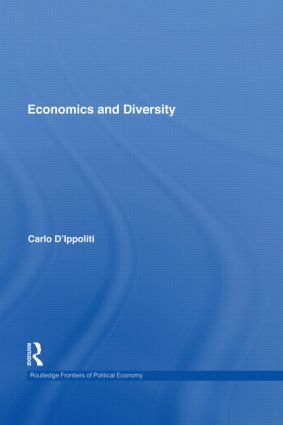 In approaching this, the book ranges from the fields of methodology and history of economics to applied empirical work, as well as gender diversity which is considered in depth. The analysis of the thinking of two major economists of the past, John Stuart Mill and Gustav Schmoller, demonstrates how gender diversity exemplifies some of the fundamental issues in economics, such as the division of labour, society’s capacity to reproduce itself, and the role of social institutions and their impact on individual and collective behaviour. The book maintains that growth of GDP and of the services sector cannot be trusted to automatically bring about greater inclusion of women in the labour market. Active policy interventions are needed, spanning from the removal of discrimination to the provision of public services and the establishment of fair competition in the market, along with an improved division of social and political power between the sexes. This work will be of interest to researchers and students focusing on the history of economic thought, labour economics, social policy and gender studies. The night in which all cows are black?